This brand new, modern, 4th-floor apartment is fully equipped and furnished. It has three bedrooms that are fully air-conditioned, 2 showers, a spacious kitchen/living/dining room leading to a terrace overlooking the sea. At the main entrance of the apartment block there are 2 small steps leading up to the elevator inside which will take you to all floors. 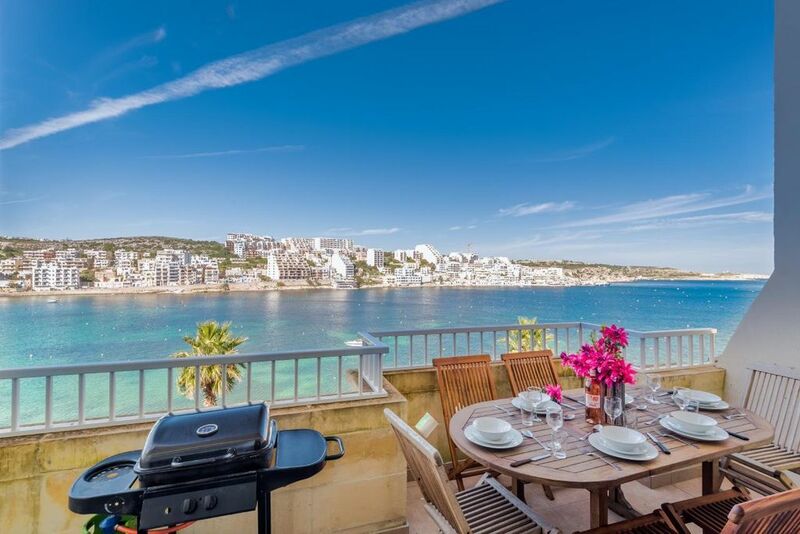 100sq m internal area, seafront terrace 7.5sq m with BBQ set, 4th floor with lift, 3 bedrooms (7 single mouvable beds), 2 shower rooms, sofa beds in the living area. Cots, highchairs, DVD player and coffee machine are available on request. Fans are provided in each room. A big gas heater is also provided in winter. We live very close and can give immediate assistance. If you like upon your arrival I can give you information and suggest to you the best places of interest and the highlights of our islands which you may visit during your stay in Malta. Please note that the apartment is not available for guests going to the Lost and Found Festival. Water: per object and day according to consumption (Mandatory).